Wait, I have to actually clean my oven? That's the line we hear the most from our friends outside of the business. You absolutely need to clean your oven, and you should do so every 6 months. Those questions and more will be answered in our Stamford Oven Cleaning FAQ. If you're unable to find an answer to your question about our oven cleaning service please give us a call at (203) 635-6135. The cost of oven cleaning depends largely on any specials we have going on at the moment. Often people don't realize that they should be cleaning their oven on a regular basis. Our job as cleaning professionals is to educate homeowners on the importance of cleaning more than just your carpets. We often include an oven cleaning special into our carpet cleaning deals. Looking for both carpet cleaning and oven cleaning? Give us a call today to see what special we have available in Stamford at (203) 635-6135. How often should I be getting my oven cleaned? Most people don't get their oven cleaned enough. You should definitely be getting your oven cleaned at least once every 6 months. 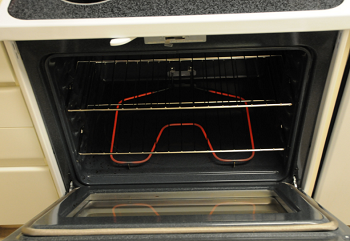 There are a ton of benefits to getting a thorough oven cleaning. One of the main benefits of getting your oven cleaned is the improvement of the overall cleanliness of the kitchen. More often than not oven cleaning goes under the radar. What are the Benefits of hiring your Oven Cleaning Service in Stamford CT? Our Stamford Oven Cleaning service is unlike most oven cleaners throughout CT because we only use eco-friendly cleaning solutions. The use or organic & all natural cleaning solutions is very important during oven cleaning. Often cheap oven cleaners use chemicals to do the hard work for them. These chemical cleaning solutions can drip into your meals for the next 4-6 months. No parents in Stamford want their kids ingesting chemical residue left over from a groupon oven cleaning service. What are the benefits of getting my Oven Cleaned Regularly? Unlike most Oven Cleaning Companies in Stamford the benefits of getting a regular cleaning done don't include going broke. Our oven cleaning service is competitively priced with the other oven cleaners in Stamford. Getting your oven cleaned regular has a long list of benefits. What other Cleaning Services besides Oven Cleaning do you have available? We have many affordable cleaning services in Stamford, CT including carpet cleaning, upholstery cleaning, steam cleaning, spot cleaning, wood floor cleaning, tile and grout cleaning, move in & out cleaning, and many more services. All of our cleaning services are done with a eco-friendly guarantee, and can be performed throughout Stamford. We get many calls from Stamford residents that are fed up with the lousy carpet cleaning job they recently received from a different cleaning company. Certain Cleaning Companies in Stamford claim that services such as carpet cleaning can't be done with the same quality at the top of the high rises in Stamford. Our Carpet & Oven Cleaning business is different, because we have 100% portable cleaning equipment that'll get you the same great clean on the ground floor as the 15th floor. To get answers about specific carpet cleaning questions refer to our Carpet Cleaning Stamford FAQ. Isn't Claiming to be the Best Oven Cleaning Service in Stamford a bit much? Everyone deserves the right to call themselves the best, but not everyone can be the best. We call ourselves the best oven cleaners in Stamford for two reasons. First, we know that we'll get you the very best oven cleaning service. Secondly, we know the competition well, and know that they don't offer nearly the same oven cleaning quality we do.